The kids were up and looking for hidden gifts this morning. Even Hailey's doll Kit got a present. Got to look everywhere for hidden presents. Steve told her she was getting a card board box for Christmas. It was full of cute doll furniture. With every present that Evan opened he told us "this is what I've always wanted!" And, of course, everybody got a new book for Christmas. After Hailey and Evan were done, it was time for Mom and Dad to open gifts. Doctor Who Legos.... who wants them more? Steve or Evan? Evan wanted to claim all the Lego sets. And finally, out on the porch was a bike! They have to learn to share. A balance bike is supposed to help the kids learn balance. I think Hailey did pretty well for her first day. Now for Christmas at the Ashcraft's. Evan just had to go out exploring with his new binoculars. And Steven just had to build a new set he got. Even on Christmas Day.... all Ashcrafts read books! 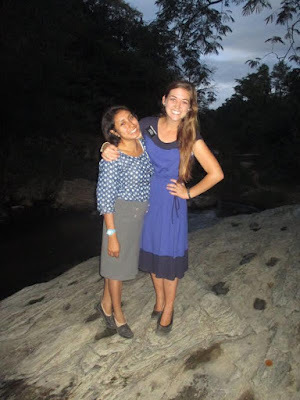 And the best part of the day was talking to Gillian all the way down in Nicaragua!